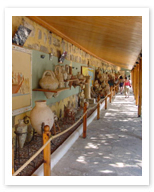 Located inside the Castle of St. John, the Underwater Archaeology Museum is a unique and fascinating museum, well worth visiting. Inside, you can see such displays as a Glass Shipwreck Hall, a full-sized reconstruction of a 7th-century Roman ship - the oldest shipwreck ever discovered, which carried 25 tons of commercial glass and sank around 1025 AD - and finds from along the coast dating as far back as the Bronze Age. There is much to see, and much to make you appreciate the dangers of a seafaring life, as well as the exceptional, surprising levels of sophistication and comfort enjoyed by the people of ancient times.